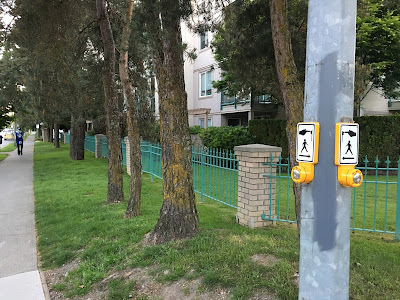 If you’ve ever walked in a community in North America, you’ve had to push a button at a signalized intersection to activate the pedestrian signal to cross a street. In urbanist circles, the term in vogue for this request device is the “beg button.” In recent years to many in the urbanist community, this lowly button has become public enemy number one as the preventer of walkability. A "beg button" in Langley City. Select image to enlarge. A quick search of “beg button” on the Internet yields many pages on the perils of this device. Recently, the furor to remove the evil button by urbanist has increased. I understand why many people now rail against this button, but the button is only a symptom. The “beg button” isn’t the problem, it is the design of our streets. In my community, most of the signalized intersections are on-demand activated. If you walk, you push a button. If you drive, an inductive loop is used to identify your presence. In either mode, this normally triggers your signal in under 10 seconds. The big gap in my community is reliable and convenient signal activation if you are cycling. When it comes to pedestrian signal activation, I’ve seen buttons that aren’t accessible, and this is something that needs to be corrected. Replacing on-demand traffic signals with timed signals to remove “beg buttons” would increase delay for all modes of travel, and actually reduce walkability. Now there are places where pressing a button to request a pedestrian signal makes no sense. Where traffic signals are on a timer, all modes of travel should get their signal without having to request it. Some on-demand traffic signals can be replaced with roundabouts. With new cycle-friendly designs, this is the safest type of intersection, and should be advocated for. We recently redesigned a street in Langley City to make it safer for walking, cycling, and driving. Narrowing the travel lanes, removing a traffic signal, installing a roundabout, adding protected cycling lanes, widening sidewalks, and tightening the turn radius at intersections, created a safer and more inviting street for everyone. Removing “beg buttons” won’t make walking safer or easier without redesigning the streets beside which they are placed. On high-speed, high-volume streets, pedestrian-activated signals make crossing safer. For example, removing all pedestrian- and cyclist-activated signals along Broadway in Vancouver will not improve walking or cycling. It would make it worse. Making streets safer and more enjoyable for walking and cycling is 90% about geometry. Complete streets are what we need. Instead of proclaiming the evils of signal activation, the urbanist community should be calling out the poor street geometries that cause them to be installed in the first place.